The A7 motorway goes to Nerja and you need to leave it at junction 292 (from Malaga) or 295 (from Granada/Almeria). To find the address on google maps search for “pasaje anduez nerja”. The passageway is number 12 on Calle Ruperto Anduez (directly opposite the chemists) and the house number is C3. You can hire a car at Malaga airport and then it is an easy drive, by motorway, to Nerja. You can also get a taxi at the airport, but it is better to book a Nerja taxi to come and get you – this will be cheaper and you will have a taxi driver that knows where you are going. A Nerja taxi will cost around €75 one way. A Malaga airport taxi will cost more. If you are arriving by car or taxi from Malaga you need to follow the signs from the A7 motorway to the town centre (junction 292 on the motorway). If you are coming from the Granada/Almeria direction, you can use exit 295 Maro, which brings you into town in the opposite direction along the N340. Our small street is off Calle Ruperto Anduez, which itself is off Avenida de Pescia, which is the N340 main road that runs across the top of the town – the turning is opposite the petrol station and local police station on the N340 main road. You can only turn into Ruperto Anduez if you are on the south side of the N340 road – you can do a u-turn at the next roundabout if you are coming from the Maro direction. Ruperto Anduez is one way and Pasaje Anduez is directly opposite the farmacia (chemists) about half-way down the road. You can’t miss the chemists as it has a large illuminated chemists sign above it. The chemists is on the right of the road, Pasaje Anduez is on the left. If you are driving you can stop outside Pasaje Anduez to drop the passengers and luggage off, then find parking on any of the surrounding streets. It is all free of charge, but make sure you don’t obstruct an entrance or park in a disabled or loading bay. Please ask if you are unsure. There is also a large open air pay car park nearby (entrance on Calle Hernando de Carabeo) which always has spaces. This is five minutes walk from the house and you can pay to park by the hour, day or week. Please ask us when you arrive if you want directions or any other help with parking. There is a private shuttle bus you can book (link below) or the public bus service. 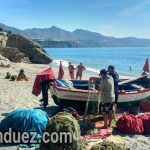 The public buses don’t go direct from Malaga airport to Nerja, first you have to take the bus (or train) from the airport to Malaga city itself and then get a bus from there (the train station is next to the bus station in Malaga). Although slower, the bus is a much cheaper option than a taxi, especially if there are only two of you travelling. Get off at Nerja’s bus station (which in reality is a large bus stop on the main road Avenida de Pescia, consisting of two lay-byes with bus shelters and a ticket office). If you are arriving from Malaga you will already be on the south side of the road. If you are arriving from the Granada direction, you will be on the north side, so cross over to the south side of the road. Once on the south side of the main road, walk past Pio Pio restaurant with its large open-air terrace (a good place for a coffee or a beer and tapas) to the large roundabout with pedestrian barriers stopping you crossing. Turn right at the roundabout down Calle San Miguel until you come to the pedestrian crossing. Cross the road at the pedestrian crossing onto Plaza Cantarero (a square with a fountain in the middle) and carry on across the square, more or less in a straight line, following Calle Plaza Cantarero then Calle Alejandro Bueno and finally Calle Herrera Oria, which ends at a T-junction with Calle Ruperto Anduez. You now turn left and walk up Calle Ruperto Anduez and you will then see Pasaje Anduez opposite the chemists. In total you will have walked for less than 10 minutes (450 metres). Our house is number 3C on the right hand side of Pasaje Anduez, second house from the end. Bus times and prices. Alsa is the public bus company, but they don’t have a direct bus from Malaga airport to Nerja, so first search for Malaga Airport to Malaga city and then Malaga city to Nerja (you can also take the train from the airport to Malaga bus station). This is the cheapest option to get here and easy enough if you are not in a hurry. We recommend this Nerja company if you want a local taxi to pick you up at the airport. Book online and pay the driver in cash – you will get better service than if you just get a random taxi from the rank at the airport. For parties of 4 or more people a taxi is not much more expensive than taking the bus. You can zoom in and out and scroll around on the map. Note that google shows this a Pasaje Anduez, 10 for some reason – but it is in fact number 12 on Calle Ruperto Anduez.